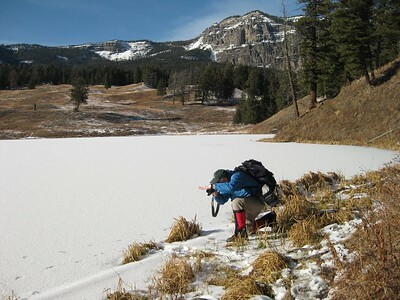 It might seem that, looking at our Picasaweb album, that we have done little in October and November, but if you are not a hunter, those months can be transition months: too late to hike, except for south facing slopes, and too early to ski. 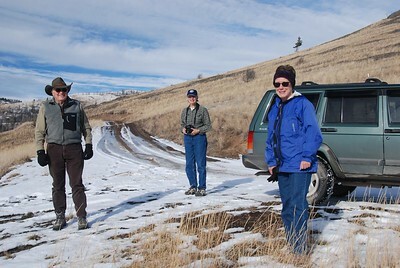 A perfect time to visit our friends Ellen and Richard, and do a bit of a search for wildlife on the northern range road thru Yellowstone. 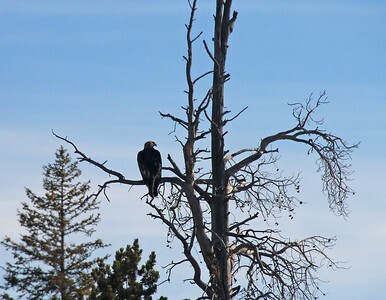 Just east of the Blacktail ponds, we spotted this Golden Eagle. He got a bit nervous when we stopped and took off quickly. 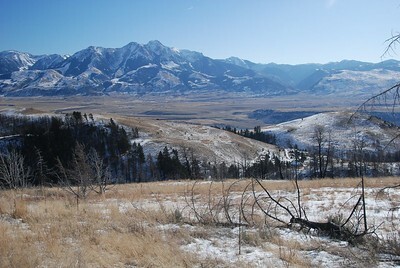 A nice view to the northeast into the Absaroka Range. 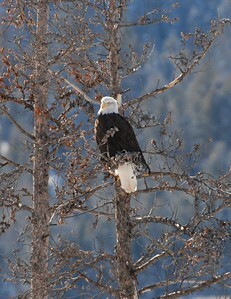 This bald eagle was sitting in a tree right above a branch of the Lamar River. Waiting for lunch to swim by. 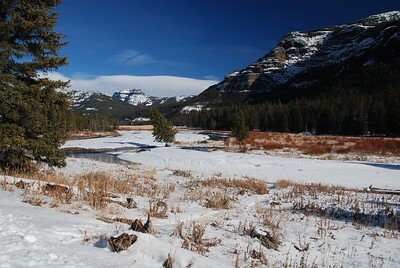 Not a lot of wildlife in the Lamar today, except for a bison herd. 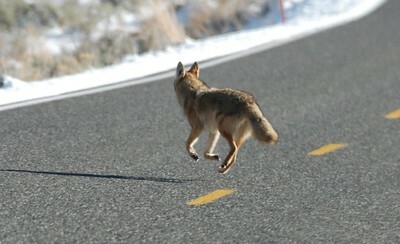 This coyote ran across the road in front of us. Not a great photo, but I captured it with three of its four legs off the ground. There: all four legs in the air. 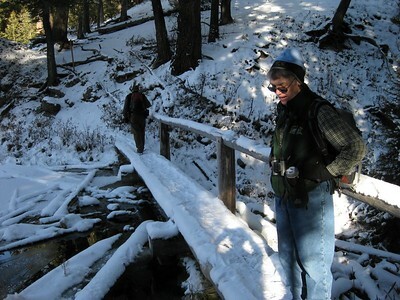 One of my favorite spots along Soda Butte Creek. I think Richard called it Round Meadow. The fisherpeople know all these names. 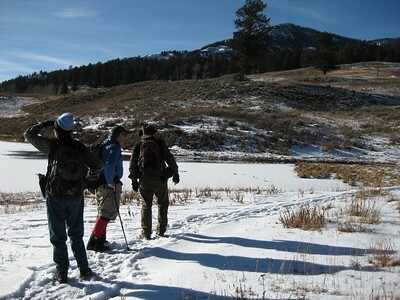 We decided to turn around, make the steep climb up to Trout Lake and look for otter. 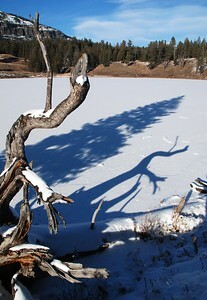 While there was little snow on the ground (surprising for this far into November), the ice on the lake was pretty think. Susie is up ahead looking for otter tracks. 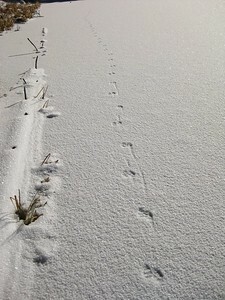 These were not otter tracks, but she captured some nice patterns anyway. Here is Roger trying to put together a composition. It proved that Susie's eye for pictures is better. 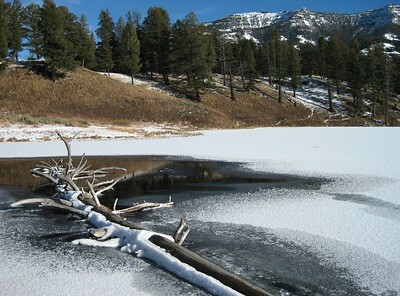 We thought we would walk around the lake, and check for otter evidence near the one spot of open water. A nice composition of Susie's, but no sign of the playful creatures. OK, Roger finally found a decent composition. 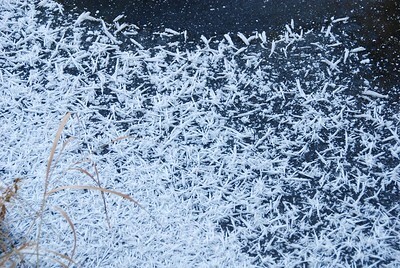 Ellen looks at some interesting ice crystals standing on the bridge over the lake's outlet. 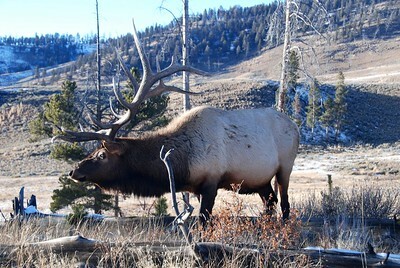 On the way back, this bull elk was along the roadway. 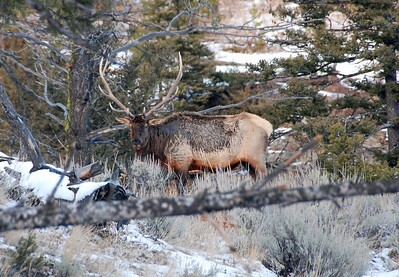 His buddy was down the way about 50 meters. 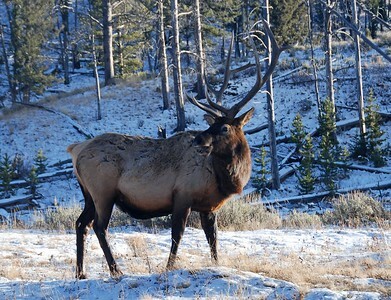 We saw this fellow near Undine Falls. His coat looked kinda ratty going into winter. 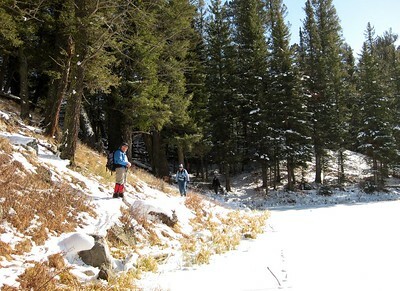 The next morning, Richard took us up the road to near the top of their "subdivision", South Glastonbury, just south of Emigrant, MT. Here is Richard, Ellen, and Susie. 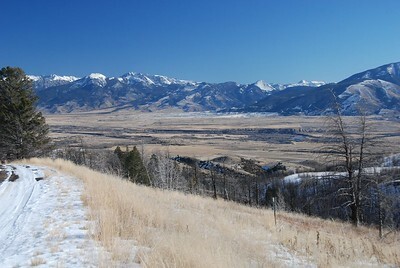 The view across the valley of the Yellowstone River, with the Mount Cowen massif in the distance. 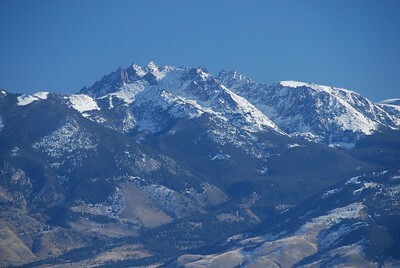 A close up of the massif. Susie and I backpacked into that area in the summer of 2008. 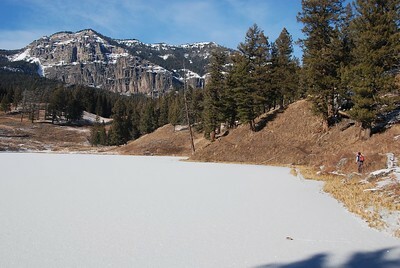 Finally, a view across the valley to Emigrant Peak.